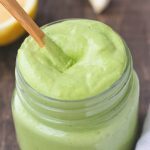 This Avocado Green Goddess dressing takes only 5 minutes to make and is bright, fresh, creamy and full of healthy fats. The perfect dressing for a spring salad, dip, potato salad or spread on sandwiches. Stores in refrigerator for up to 10 days. You can use frozen spinach, but it will change the consistency a bit.